Thank you in advance for your assistance. How much soluble fe will Manganese Dioxide remove per ft3? On the service, let's say its 15 ppm, does that mean if I get a 2 ft3 unit, it will remove up to 30 ppm of fe? It’s a good question, but no, it doesn't quite work like that. Besides the total amount of iron removed per cubic foot before the iron filter needs to be backwashed, we also have to consider the flow rate. This is how fast the water is flowing through the filter. The higher the flow rate, and greater the levels of iron, manganese and hydrogen sulfide present, the greater the media capacity you’ll need. 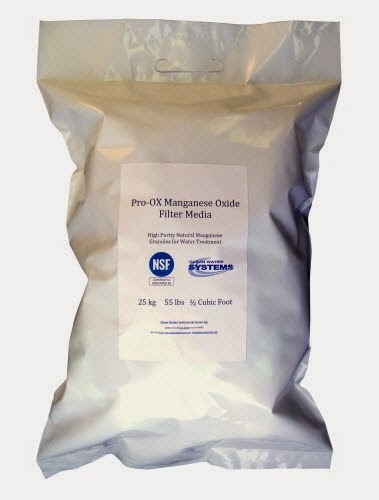 High purity manganese dioxide, such as our Pro-OX iron filter media, does have a much higher flow rate than other iron filter media such as greensand or Birm, but the flow rate is still important. With filter media, it’s not based on the cubic foot capacity, but rather the cross-sectional square foot area. A single square foot of media capacity can handle 5 to 10 gallons per minute of water sent through it. For example a 13” diameter tank has one square foot of filter area. For iron levels over 10 PPM we recommend a flow rate of 3 to 5 GPM per square foot of media. However to answer your question directly, one cubic foot of media can oxidize and filter approximately 10,000 PPM of iron. Manganese dioxide works with the oxidation capacity of the water, and this is aided by the injection of chlorine, particularly when the iron is at very high levels. The oxidant demand is equivalent to the total quantity of chlorine required to oxidize soluble iron, manganese, and hydrogen sulfide in the raw water. Based on total oxidant demand we can remove 10,000 mg/L per cubic foot. Or another way to say that, the most that can be removed per cubic foot is about 10,000 PPM. 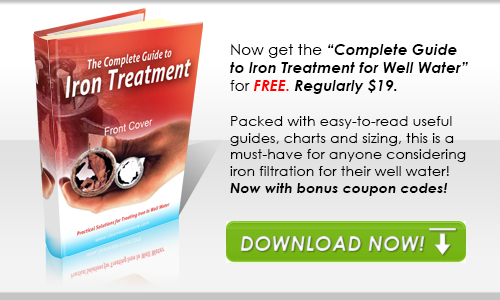 For iron (Fe+2) alone: 10,000 mg/L Fe/cu. ft.
For manganese (Mn+2) alone: 5,000 mg/L Mn/cu. ft.
For hydrogen sulfide (H2S) alone: 2,000 mg/L H2S/cu. ft.
oxidant demand = [1 x mg/L Fe] + [2 x mg/L Mn] + [5 x mg/L H2S]. Raw Water: 15.0 mg/L Fe x 1.0 = 15.0 mg/L Cl2 equiv. 1.0 mg/L Mn x 2.0 = 2.0 mg/L Cl2 equiv. 2.0 mg/L H2S x 5.0 = 10.0 mg/L Cl2 equiv. Capacity: 10,000 mg/L divided by 27 = 370 gallons/regeneration/cu. ft.
Based on this calculation above, one cubic foot of manganese dioxide will be able to process 370 gallons before regeneration (backwash and rinse) is needed.